Ever have trouble seeing where you spray? This handle illuminates the area the spray can is pointed at, making it far easier to put the product where you want it. Can-Light is a new patented tool that allows you to see what and where you are aiming by incorporating an ingenious combination of a flashlight and a powerful trigger spray mechanism that easily fits most any aerosol can top. Use with products such as lubricating sprays, disinfectant sprays, cleaning products, paint, etc. 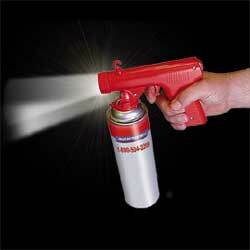 Can-Light illuminates any dim lit area and allows you to spray with pinpoint accuracy. Use in dark areas such as behind refrigerators, next to stoves, under sinks, workshops, boats, under automobile hoods. Can-Light also doubles as a great device for keeping toxic areosol products off your hands. Includes 2 AA batteries, two flashlight bulbs and a handy balanced hanger.